News // We have liftoff! IT’S HERE!!! 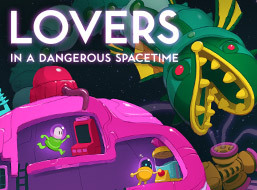 Lovers in a Dangerous Spacetime is OUT NOW for Xbox One, PC, Mac and Linux. Thanks SO MUCH to everyone who helped us make it to this point, it’s been a long, long journey. It’s so exciting to think that our little game is out there floating around the universe now. Should you play this game? YES. “Teamwork doesn’t get much sillier or more serious than it does here — nor does it get much more entertaining or original.” Score: Buy It. If you dig the game, please like, share, retweet, review and galactically transmit this news across the universe. It’s only because of our fans that we ever made it this far. Making this game has been an incredible experience, and we can’t help but say thank you to the all the wonderful people who have helped us along the way. We wouldn’t be here without you. THANK YOU.